Best friends and unofficial brothers since they were six, ninth-graders T.C. and Augie have got the world figured out. But that all changes when both …more Best friends and unofficial brothers since they were six, ninth-graders T.C. and Augie have got the world figured out. But that all changes when both friends fall in love for the first time. Enter Ale. She’s pretty, sassy, and on her way to Harvard. T.C. falls hard, but Ale is playing hard to get. Meanwhile, Augie realizes that he’s got a crush on a boy. It’s not so clear to him, but to his family and friends, it’s totally obvious! 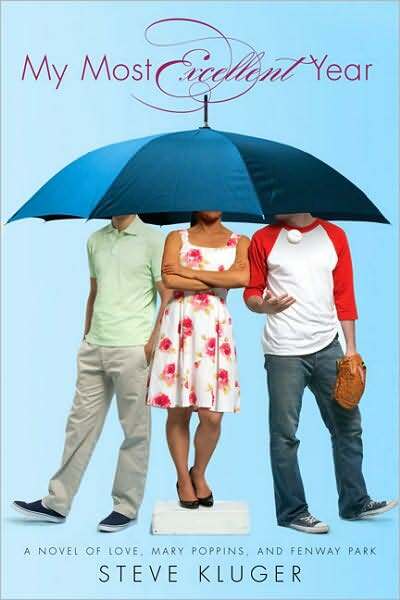 Told in alternating perspectives, this is the hilarious and touching story of their most excellent year, where these three friends discover love, themselves, and how a little magic and Mary Poppins can go a long way. Why did I read this book: Because of this review. it is unflinchingly, over the top, with-no-shame-whatsoever the happiest book in the world. Ain’t nothing but blue skies. She had me at hello. And she was right too: My Most Excellent Year is an extremely happy book. Like ponies and rainbows and butterflies in a field of dreams, happy. And it has so many elements that I LOVE like the fact that it is an epistolary novel with romance and theatre and musicals and Mary Poppins and romance and kissing and I really loved it and hugged the book once I was finished and will treasure it like I treasure beautiful fairytales. I reviewed The Ghosts of Ashbury High by Jaclyn Moriarty a couple of days ago and I talked about how much I love epistolary novels and it is funny (and most excellent) how both books follow a similar format with both being written as school assignments. In this case, three kids: Augie, Alejandra and T.C. writing about their most excellent year which was their freshmen year of high school in letter format as well as having IM convos, emails between all of the involved (including their parents), theatre reviews clippings from Augie’s mom. T.C. addresses his letter to his late mother. She died when he was six and that when he became best friends with Augie. They became such good friends that they decided that they are in fact brothers and have been ever since. Both their families adopted each other too and T.C has a room at Augie’s and calls his parents Mom and Dad and Augie has a room at T.C.,’s and calls his dad pop. T.C.’s narrative covers his relationship with his dad, his love for baseball especially the Red Sox, and his love for his brother and his new found feelings for a girl named Alejandra. Then he befriends a small deaf kid who lives in an orphanage. Alejandra is Mexican, daughter of an ambassador and her families have Big Plans for her but really Alejandra just wants to act and dance more than anything but she thinks her family would never allow that. She might be falling for T.C. but she thinks he is too cocky and perfect. Her letters are addressed to Jacqueline Kennedy and Alejandra is an incredibly interesting, strong-willed female character. Augie is Chinese – American, plays soccer and loves all things about theatre. He is dramatic and loud and AWESOME, AUGIE I LOVE YOU. He addresses his letter to several Hollywood divas and when he starts to develop a crush on another boy named Andy Wexler, he realises that he is gay, a fact that doesn’t surprise anyone, not even his father who had been waiting for him to realise that so that they could talk about it. And that is quite possibly my favourite thing about the book: that there is never a “coming out” for Augie. I love that and that is exactly what My Most Excellent Year proposes. But Augie’s story is only but a part of the book and there are many other things to love about it. All the theatre references including reviews by Augie’s mom in which she criticises several well loved musicals and they made me think so much and review things I never thought about. Or how the story is also about perception. There is a very telling story that is recounted by both Augie and T.C. about how one day T.C. showed up at school with his shirt inside out and then all kids did the same. For Augie it showed how much T.C. was a leader whereas T.C. thought the kids were making fun of him . All of the relationships are incredible too especially the one between Augie and T.C. and never once did I not think that they were NOT brothers. There is so much love and acceptance in this novel and about choosing who you love rather than that being determined simply by biology. Where the novel fails slightly for me is in the relationship between T.C. and Hucky, the small kid he befriends. I mean, don’t get me wrong, it is beautiful and it certainly goes back to T.C. own childhood and how Augie helped him get through his mom’s death but there are certain aspects of that relationship that are too fantastical ( I am not going to spoil) and too much of a stretch. Plus, everybody is so perfect and nice. The kids, the parents, teachers, students, even *gasps* older brothers and although this certainly infuses the novel with a lever of heart-warmth that is hard not to succumb to it also sort of undermines the entire point of Augie’s storyline – because his fairytale is within the realm of possibility one day, but the others aren’t because as Jack Lemon once said: nobody is perfect. You know you’ve earned your wings as a father when you drop by your kid’s bedroom to kiss him good night and on your way out of the door he stops you cold with “Dad? Is love supposed to hurt?” I’m not sure if there’s an easy answer to that particular riddle (yes, I am – there isn’t), but hearing that question from my son is the reason I wanted to be a parent in the first place. How did he know? All he really needed to hear was that he’s not the first kid who’s had to go through this. (Isn’t that usually what it takes?) by the time I came back from the bathroom with his glass of water, he was already out like a light. And while I was tucking him in, I realised that we’d never had the “I’m gay” conversation. Has this generation finally made it superfluous? If only. Additional Thoughts: Augie has a website! It is hilarious and full of cool things to check out (and links to Ale’s and T.C.’s too). Status: In a relationship. His name’s Andy. His eyes don’t match any color in the spectrum, so we think he invented Andy Blue. weeks. Now I’m SO over her. Orientation: Gay. Normally you can only go as high as a Kinsey 6, but they gave me an 8. Rating: 8 – Most Excellent! 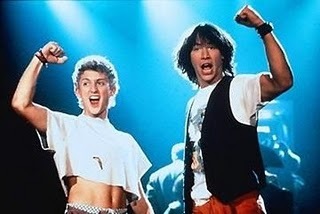 …is this an inappropriate time to mention that I totally ship Bill and Ted now? I mean. What. Okay, I am going to reread this book and let it make me happy. Yeay! One of my daughter’s favourite books and well high up on my TBR pile. SO glad you enjoyed it. I LOVED this one! So glad you enjoyed it as well!!! I’ve loved Kluger books before, so I’m guessing I’ll feel the same way about this one. Ordering…now. Bloody hell. I’d promised not to buy any more books, but this sounds too good to resist.